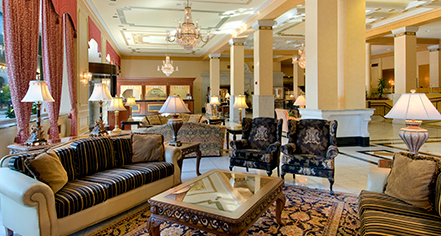 Situated in the heart of the city, the historic Hilton St. Louis Downtown at the Arch offers refined Midwest accommodations in a distinguished setting with convenient access to the premier cultural attractions of Missouri, including Busch Stadium, the Gateway Arch, America's Center Convention Complex, and the historical Laclède's Landing. Formally the Merchant Laclede National Bank, this Greek Revival landmark boasts 195 sophisticated guestrooms and suites in a variety of styles, award-winning cuisine at the refined 400 Olive restaurant, and plentiful amenities and services, including a fitness center, oversized whirlpool, 5,000 sq ft of meeting space, and gracious hospitality. 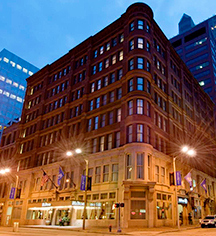 Hilton St. Louis Downtown at the Arch, a member of Historic Hotels Worldwide since 2015, dates back to 1888. The hotel still houses the original bank vaults of the Merchant Laclede National Bank and are currently utilized as the business center. Deposit: Credit card or cash deposit required. Early Check-In/Late Check-Out: Early Departure Fee: 100% of room rate + tax for 1 night. Late Check-Out Fee: 100% of room rate + tax after 3pm. $75 until 3pm. Parking: Self-parking: $23.00 (Covered Garage). Valet parking: $30.00 (Valet Parking). Secured: Available. Covered: Available. In/Out Privileges: Available. Other Parking Information: Parking fees subject to change without notice. RV, Bus, Truck parking. Smoking Policy: Non-smoking property. A fee of up to $250 USD will be assessed for smoking in a non-smoking room. Please ask the Front Desk for locations of designated outdoor smoking areas. Learn more about the History of Hilton St. Louis Downtown at the Arch .